During my childhood, this was my favorite Christmas cookie. My mom used to always make them for the family as well as an extra batch that I could take to school and share with my friends. I have modified the recipe to use a chocolate cake mix which really helps me save some time now that I make them for my family. The candies on top are Brach's milk chocolate stars. I always loved the way these chocolates would get slightly melty - it's the best time to enjoy these cookies - when they're warm and right from the oven! Add walnuts to shallow dish; set aside. In a large bowl, add cake mix then cut in butter until mixture turns crumbly. Add egg and 2 tablespoons water and mix well. Shape dough into 1/2-inch balls then roll in nuts to coat. Place nut-coated cookie dough balls on ungreased cookie sheets at least 2 inches apart. Bake for 12 minutes or until cookies get a little puffy. 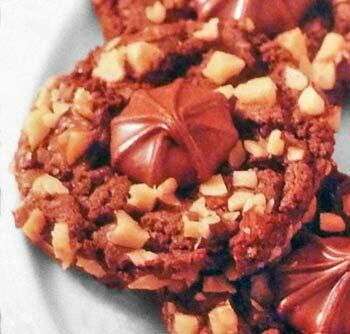 Remove from oven and place one chocolate star in center of each cookie and return to oven for 1 minute. Remove from oven and allow cookies to sit on sheet for 1 minute before transferring to wire racks to cool.